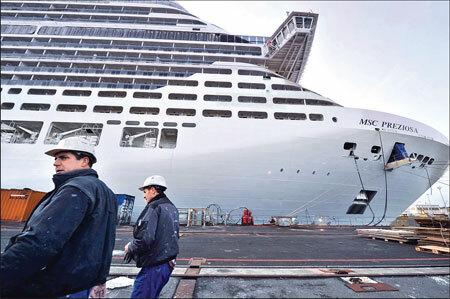 An ailing French shipyard landed a billion-euro contract Thursday as a US cruise company announced it was ordering a massive luxury liner from STX France at Saint Nazaire. The deal comes as a lifeline to the shipyard, which had failed to secure any major orders for nearly two years. French Prime Minister Jean-Marc Ayrault, a former deputy for the Atlantic coast region, hailed the news praising "the excellence of French know-how in naval construction". Miami-based Royal Caribbean International said it was ordering a sister ship to its two top-of-the-line cruise liners, the Oasis of the Seas and Allure of the Seas, with an option on a second vessel. "This contract exceeds 1 billion euros representing over 10 million hours' work over three years for the Atlantic shipyards and their sub-contractors," said French Finance Minister Pierre Moscovici in a joint statement with Foreign Trade Minister Nicole Bricq. "We are very satisfied," STX France chief executive Laurent Castaing told France's I-Tele. "The competition with Finland was fierce." The company's two other Oasis-class liners, built in Turku, Finland, cost 900 million euros ($1.2 billion) each according to the trade press. They were delivered in 2009 and 2010. For the French shipyard it is a welcome boost after four years blighted by the financial crisis. The SXT France yard employs 2,100 people, supporting another 4,000 sub-contractors. Studies will start in January 2013 while construction is planned to start in September. "We are extremely proud to have been selected by Royal Caribbean International to build this third unit," STX France managing director Laurent Castaing said in a statement. "The ship is a real exception in the cruise world as it is highly innovative and spectacular." Royal Caribbean said its capital spending would be $1.3 billion for 2012; $700 million in 2013; $1.2 billion in 2014 and in 2015; and $1.3 billion in 2016. Belgium's Liege airport, one of Europe's busiest freight hubs, hopes to entice US parcel delivery firm FedEx away from Paris airports should Dutch firm TNT Express depart for Germany. The head of the Liege airport board, Jose Happart, told daily newspaper La Libre on Saturday that the airport was eyeing a deal with FedEx should the Dutch company go as the result of a looming tie-up with US delivery giant United Parcel Service (UPS). UPS launched a 5.16-billion-euro ($6.71 billion) takeover bid for TNT Express last year. If approved by EU anti-trust authorities, UPS could well decide to move the Dutch firm's Liege operations -- involving some 2,000 jobs -- to its own UPS hub in Cologne, in order to streamline services and management. "If TNT goes there is another big company, FedEx, which is currently based in Paris," said Happart. "We will try to attract it here in part." But he added that "if TNT were to leave Liege Airport, it would likely not be a total withdrawal." UPS said in November that it had amended its multi-billion-euro bid for TNT Express to meet EU conditions and close the deal by next year. The European Commission competition authorities said last year they were worried that the proposed merger would reduce the number of so-called integrators from four to three and lead to a highly concentrated market for domestic and international express delivery services. UPS and TNT Express are major players in the sector for delivery of small packages and are two of four firms with a comprehensive air and road delivery network on the continent. Others present in Europe are DHL, owned by Deutsche Post, and FedEx, a US-based company. The deal is expected to put UPS ahead of its two competitors as it would strengthen its position in Europe and globally. TNT Express is a global player operating in more than 200 countries and maintains a leading role in the road freight network in Europe. UPS is the world's biggest package-shipping group, with annual revenues in 2011 of $53.1 billion and 400,000 employees. Ship building firm STX Finland is to reduce its headcount after it failed to clinch a one billion-euro ($1.33 billion) cruise ship order, the Finnish Metalworkers' Union said on Wednesday. "The financial situation and the loss of the Sanctuary cruise ship order to France means the company's fixed costs have to be reduced by 30 percent," the union said in a statement. A union representative, Jari Aalto, said talks over job cuts would begin on January 8. STX Finland has around 2,200 employees, and "several hundred" jobs are at risk, he added. The Finnish government had turned down a request from the troubled company for a 50 million-euro loan to help it secure the order. Miami-based Royal Caribbean International last week announced that the order for a sister ship to its two top-of-the-line cruise liners, with an option on a second vessel, would go to the company's rival STX France. The company declined to comment on the number of redundancies when contacted by public broadcaster YLE.